Recently, I went to the ever-popular Chicago staple, Carnivale, to check out the restaurant’s new raw bar. I love any excuse to go to Carnivale, from cocktails and dinner to the restaurant’s annual pajama brunch party. Carnivale is an exciting restaurant; the food is consistently delicious; and the cocktails are fun and tasty. I was sad to have missed the preview party for the new raw bar menu last week, but the restaurant was kind enough to invite me in and I can never pass up anything that the folks at Carnivale throw my way. Arriving for dinner around 7 p.m. with Svetlana, who lives a mere block away, we were both quite surprised to see how busy the restaurant was. It was a Wednesday, for one, and also the restaurant is huge, therefore it takes a lot of people to make the space look busy. The dining room had most of their tables filled, from couples on dates to large groups celebrating birthdays. After we placed our orders for cocktails, our lovely server quickly guided us through the raw bar offerings, and suggested that we get the Seafood Tackle Box for two. We took her recommendation and ordered that along with the empanadas de elote. 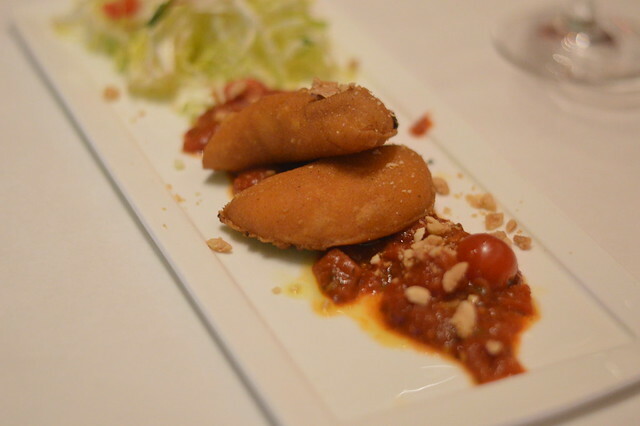 The empanadas arrived to the table first, and they were the perfect small starter for us. While the ropa vieja is Carnivale’s signature appetizer, and they are insanely delicious, I would also have to strongly recommenced these. They were light, creamy, and the perfect corn stuffed pockets to start our meal. As a seafood lover, I don’t see how a raw bar could ever be a bad choice, but out of the many raw bar seafood towers and offerings I have seen before, this is definitely one of the most memorable. 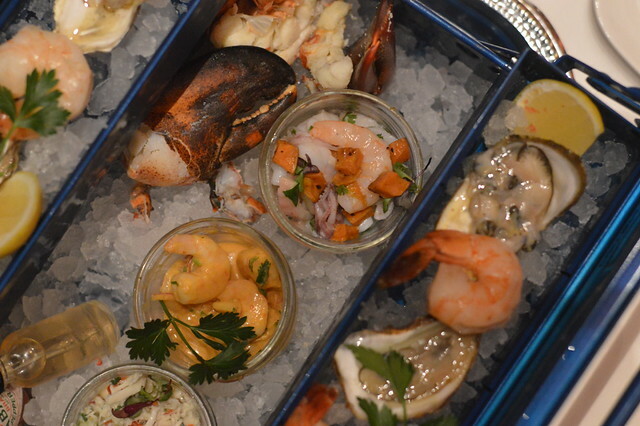 For starters, the tackle box is an amazing way to present the seafood. 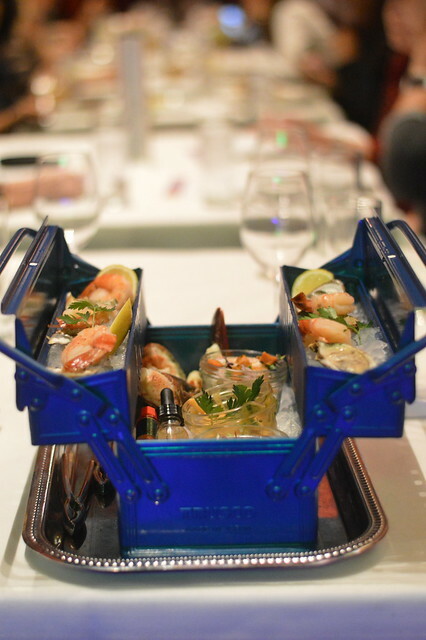 A blue metal tackle box arrived to the table on a silver platter. Our server then opened the tackle box, exposing the goodies inside: three East Coast oysters, three West Coast oysters, poached Maine lobster, poached shrimp, and the Chef’s choice trio of ceviche. 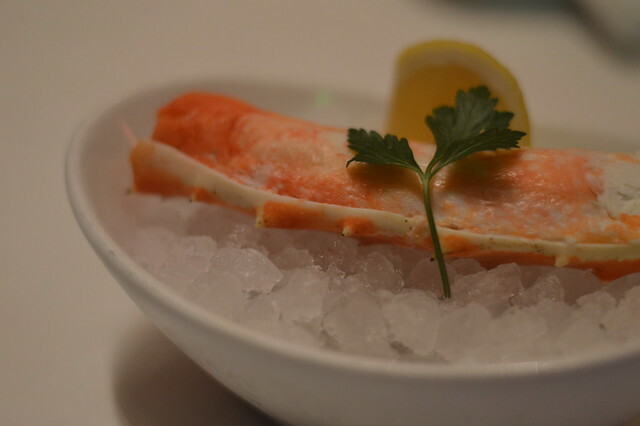 Additionally, we also requested to try an Alaskan King crab leg. When in Rome. The seafood came accompanied with lemon wedges, hot sauce, cocktail sauce, and champagne and red wine mignonettes. Additionally, Chef must have been reading our minds, because he chose the three ceviches we had been eyeing out of the four offered on the menu. Little containers of ceviche were place in the middle of the tackle box on ice. One with poached gulf shrimp, roasted pineapple, gochujang, coconut, and basil. The second one was a mixto with shrimp, calamari, octopus, barramundi, preserved lemon, leche de tigre, mote, sweet potato, red onion and cilantro. 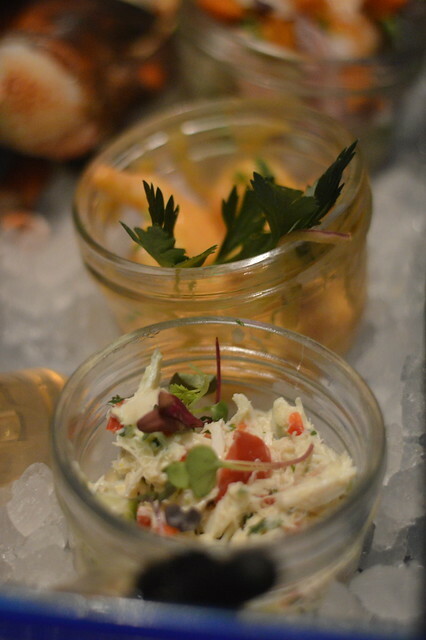 The third ceviche was one I had never encountered before, but I was all about it; I love blue crab anything. The blue crab ceviche was made with lumps of fresh crab meat, chunks of avocado, key lime juice, red onion, cilantro, and an ailoi. Satiated after having ordered a side of traditional potatas bravas as well, we refused our server’s offer of anything else to eat for the evening. 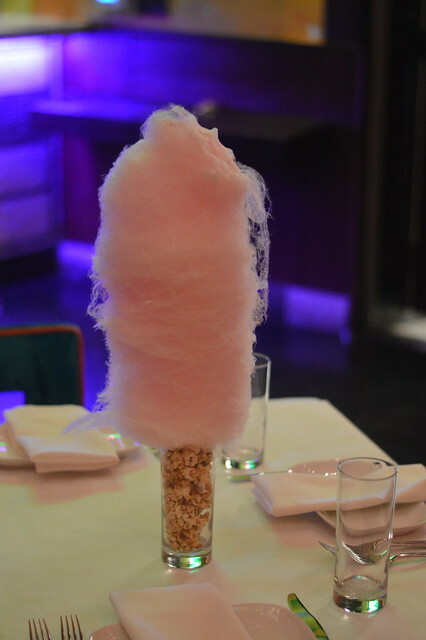 As we were ready to settle up and head out, we saw many of the tables around us celebrating with a jumbo cotton candy dessert. Again, our server read our mind, and brought one over. She figured it would look great for photos; a woman of my heart. I love the new raw bar offerings at Carnivale. 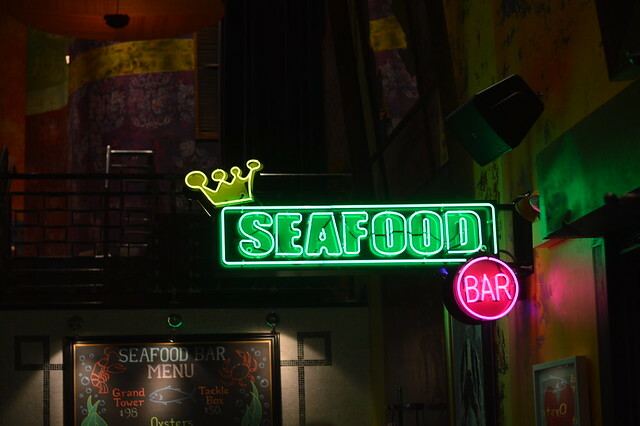 It is the perfect place for celebrating with a group of friends and ordering the seafood tower, but the tackle box is also just the right amount of food for two to three people to share. The raw bar menu items are priced reasonably, which means that you can act like a baller on a budget. There is a reason why Carnivale is still one of the most popular restaurants in Chicago after more than a decade While the restaurant stays true its foundation, it has continued to evolve creatively over the years, and offer seasonal items, to keep diners interested.